One of the biggest changes to the Maryland school system this year was moving the start of school to after Labor Day. This is an important day for sellers because it marks the day that family buyers start to leave the marketplace. Anyone with children understand the difficulty of transferring their kids mid school year. Friendships get broken, class content doesn’t line up, and learning is stifled. As a result families choose to buy houses and move during the summer season while their kids are on school break. Following this exodus of family buyers is what’s known as Maryland’s slow season. 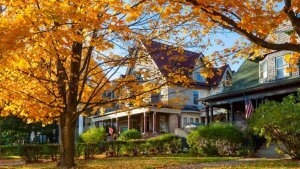 For home sellers this typically starts in the Fall and carries through the Winter season. The Maryland weather shifts from cool to cold, buyers become busy with the holidays, and ice and snow can wreak havoc on scheduled showings. Without a large buyer pool it becomes difficult to sell top dollar in Maryland. Yes, it’s true, as a seller you have a lot on the line. If you miss this opportunity you may not be able to sell top dollar in Maryland without having to wait for the Spring season. This deadline can be stressful but don’t worry, with proper preparation and a strong marketing plan you can use this time of year to your advantage! You Need to Sell Top Dollar in Maryland and Buyers Need to Buy Fast! Enough of the cons, let’s talk about the pros! Just as you’re looking at a winter season short on buyers, buyers are looking at a winter season short on new inventory. Sellers get busy too and few want to list their homes during the holidays. With the pressures of school starting and a winter season short on inventory, most buyers are highly motivated this time of year to buy. To sell top dollar in Maryland we need a proven market plan which we will lay out below. “Wait! Didn’t we just go over the fact that I want to sell top dollar? Doesn’t dropping the list price mean that I’m willing to take less for the property?” Great question! When we drop the list price we do it in a way that’s strategic in order to attract as many of these motivated buyers as possible. This is very important if you have a stale listing that’s been on the market for over a month. If showing traffic has died down then keeping the current price will only continue to provide a slow trickle of showings. The goal of a price drop is to jump start the showings volume and entice a multiple offer situation. An offer is only the beginning of the negotiation process and many sellers we work with find that by dropping the price they’re given more leverage to push back on other costly concessions such as paying for the buyer’s transfer taxes and closing costs. With this additional leverage our sellers find themselves walking away with more money in their pocket even though the purchase price is lower than their original list price. When looking to sell top dollar in Maryland, it’s all about how much you walk away with in your pocket. As a client of AE Home Group you have an advantage over most other home sellers. Our experienced team has a proven track record of outperforming the competition in pricing strategy. This competitive advantage is critical when trying to sell top dollar in Maryland. Once we make the price drop we’ll want to schedule an open house. What this open house does is give us a way to measure the price drop’s impact. A large attendance of represented and unrepresented buyers does three things. One, it proves that the market has responded positively to the price drop. Two, it give us as the listing agent the ability to survey potential buyers for the roadblocks that may be preventing and quick sale. Three, it allows us to tap into the unrepresented market of buyers that may be interested in your home but don’t have the ability to draft an offer. Although uncommon, these off-market buyers can be some of the best ways to sell top dollar in Maryland. Pricing strategy can be like balancing on a medicine ball in an earthquake. There are so many moving parts in the market that you need a team of experienced professionals like AE Home Group who can track the metrics that matter and analyze market activity on a day-to-day basis. How many and how fast buyers leave the market can vary year-to-year, but by using a professional team like AE Home Group you are sure to have the competitive advantage you need to get top dollar in Maryland. If you’re looking to sell top dollar in Maryland’s competitive housing market give use a call at (443) 826-9024 or fill out this short form.